Outgoing president Jim Dunlop (left) congratulates Colin de Fleury as the new president of Carrickfergus Rotary Club for the 2018/19 Rotary year. 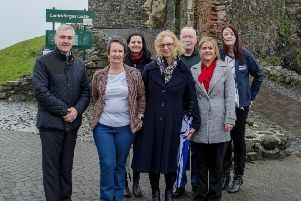 Carrickfergus Rotary Club has an eye on future leaders as the organisation steps up its focus on youth opportunity projects. Engaging with schools in the town will be among the roles of the club’s new president, Colin de Fleury and new president-elect, Hilary McGavock. Rotary president Colin de Fleury and Hilary McGavick who will serve as the club's president during the 1919/20 Rotary year. Colin has been a member of Carrickfergus Rotary since 1999 and this is his second term as president having previously led the club in 2008/9. Throughout his membership he has been very active in all activities having chaired the international, membership, and community & vocational service committees as well as serving for extended periods as club secretary. He was an aeronautical engineer and moved with his wife Judith and family from Cambridge to Carrickfergus when he retired in the late 90s. Apart from his involvement with Rotary Colin is a “keen gardener and an even keener sailor”. He is a member of County Antrim Yacht Club and a senior sailing instructor. President Colin plans to “increase the club’s profile in the community through engaging with local projects, increase membership, support youth opportunity projects by engaging with local schools and on the International front, support the ‘One Last Push’ programme for the eradication of polio worldwide”. President elect Hilary joined the club three years ago as an associate member but converted to full membership in 2016/17 Rotary year. She has led the Youth Activities programme during the past year including local successes with the Youth Leadership competition and the Young Writer programme. As part of her remit she also liaises with the two local Interact Clubs. Hilary has recently retired from her job as practice manager for a medical practice in Limavady. She is married to Jim and they have a grown-up family. She is “very much looking forward to engaging with all club activities in the incoming year”. Immediate past president Jim Dunlop congratulated both of them and wished them a successful year.